Soil vapour extraction (SVE) is an in-situ remediation technology in which a vacuum is applied to the soil usually through boreholes/trenches to induce a flow of air through the unsaturated (vadose) zone soil and remove volatile and some semi-volatile contaminants from the soil. The extracted air containing the contaminants can then be treated to recover or destroy the contaminants. Soil vapour extraction remediation systems are commonly combined with other remediation techniques such as; air sparging and dual (multi) phase extraction. Generally a contaminant with a vapour pressure of greater than 1.0mm Hg at 20°c and a Henrys Law constant greater than 0.0001atm/m3/mol will be suitable for SVE. 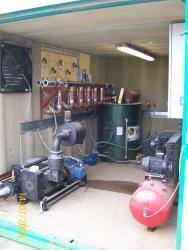 The pumps, knockout pot, control systems and manifolds can be located within a small container for transport to site. Vertical extraction wells are typically used at depths of 1.5m or greater. 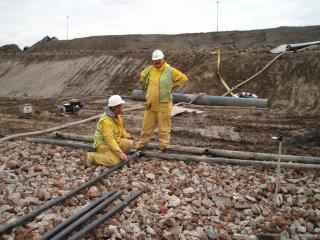 Horizontal extraction trenches can be used as required by site-specific and contaminant plume factors. A surface cover can be placed over the treatment zone to prevent short circuiting and to increase the radius of influence of the wells/trenches. Air sparging can be combined with SVE when volatile contaminants are below the groundwater table. This is used to assist in the volatilisation of contaminants to improve contaminant removal rates. Volatiles are then collected via SVE within the unsaturated zone. Additionally air injection (air sparging) is effective in facilitating in-situ bio-degradation and turning anaerobic environments aerobic. Other enhancements can be made for some contaminants such as steam injection. This enhances recovery by increasing temperature and thus volatilisation. VertaseFLI has designed and built numerous combined SVE remediation units including a unit capable of soil vapour abstraction via specially constructed vapour recovery trenches located in three separate contaminant plume areas. The SVE unit was combined with air sparging equipment, capable of supplying air to 170 sparge wells located within the three plume areas. Sparge air was provided via a blower to sparge wells located within the three plume areas, vapour was abstracted via specially designed abstraction trenches within each area, using a vacuum pump and knockout pot system. Vapours were treated with granular activated carbon, waters collected within the inlet separator were pumped from the knockout pot into an onsite water treatment systems similar to those within our pump and treat section. The control system within the unit allowed individual plume areas and/or combined plume areas to be remediated simultaneously, improving the flexibility of the system. The unit operated for 27 weeks and successful recovery of solvents such as trichloroethene (TCE), dichloroethene (DCE) and vinyl chloride (VC) from the saturated and unsaturated soil zones was achieved. The system was fitted with an online FID to assess vapour recovery.